When term limits came up recently, KingstonCitizens.org was excited to perhaps have an opportunity to vote for such a thing in November – but alas, it was shot down by the common council. Upon further investigation, I wondered some if it was wise to isolate any one part of the charter when indeed the entire thing stood to be overhauled. What Kingston really needed was an updated comprehensive plan to address the entire ball of wax. At the same time, and sort of out of the blue – city of Kingston planner Suzanne Cahill brought the comprehensive plan issue into the limelight again – for a third time since we’ve been active. It came before the city’s finance committee last week, and a $100,000 bond to proceed was approved unanimously. It will be sent to the common council shortly which we expect will bode well. That might mean that a comprehensive plan will be in the works in Kingston soon, something that hasn’t been done citywide….since 1961. The current CP is older than I am. Term limits and a multitude of other issues can be approached then. I think we’re all ready for an overhaul of many things. Now on the radar is who the city will choose as a consultant. That’s going to be incredibly important. Be aware, and stay tuned. We took the time to ask Mayoral candidates in this election cycle where they stood on the matter. Note: We reached out to all candidates on many occasions, and heard back from all but Republican candidates Richard Cahill and Ron Polacco. KC.org: Recently, an effort to place term limits on the November ballot was shot down by the majority of the common council. Do you feel that the voters should have the opportunity to decide whether or not term limits are instituted in the city of Kingston? Shayne Gallo: I can’t think of any reason to deny the public a voice on term limits. Hayes Clement: I have philosophical and practical objections to the idea of term limits for elected officials — other than U.S. presidents and, perhaps, state governors — especially at the local level. For starters, term limits actually limit elective choices for voters, by mandating that incumbents, at a certain point in their service, step down from office, regardless of the job they are doing or how they are viewed by their constituents. Preventing a duly qualified citizen from standing before the voters and running for office, especially when that citizen is a known quantity for having served in that office, limits a voter’s choice in a very significant way. Let voters decide who has served long enough, using the term-limit mechanism we already have in place: elections. Jean Jacobs: The power of the people will be the driving force for change. Steve Ladin: I absolutely believe that voters should have the opportunity to decide on term limits for all of their elected officials. KC.org: In our research 97% of incumbents were voted back into office. Do you feel that voters are generally satisfied when they re-elect a public official, or that it’s primarily due to party line or name recognition? Shayny Gallo: I believe that when voters are satisfied with their elected officials they vote to return them to office. Jean Jacobs: I do not believe voters are satisfied with incumbents I feel it is lack of education and informing the voting public with the facts. Steve Ladin: I think that each election, with its cast of candidates is unique. Often times, incumbents are re-elected due to name recognition and party affiliation, without regard to the quality of their service. In other instances, some incumbent elected officials have provided excellent service to their constituents, and have earned the privilege of continuing their service. Andi Turco-Levin: Society has changed where people are less likely to pay attention to things that do not directly interact with their daily lives and local politics is one example. Complacency and lack of interest is evident on election day when less than 50% usually vote in a local election. Take into consideration that ‘insiders’ or ‘those in the know’ are the ones who are voting which can influence the outcome as well. The remainder of the voters tend to take notice of their elected officials only during the election cycle and do not follow what they are doing for the remainder of their terms. This is when name recognition or party affiliation can influence the outcome. Incumbents also have the edge when it comes to raising campaign funds which is a key component to winning an election. KC.org: We’ve found that those who are proponents of term limits feel that they will allow for more citizen public service while opponents are concerned that good leadership may be lost. Where do you stand on the subject and why? Shayne Gallo: While personally I do not support term limits, I believe that the public should have the final say. Generally, incumbents bring valuable experience and knowledge and I believe that the public should have the right to elect who they want without imposing artificial limits. Hayes Clement: From a practical standpoint, as an alderman I have seen first-hand how often difficult it is to recruit people to run for office or serve on public boards and commissions, so the idea of limiting the time an engaged and willing person can actually serve strikes me as seriously counterproductive. The idea of imposing term limits locally strikes me as a classic case of a “solution in search of a problem.” What we’re talking about here is a fundamental change to the city charter, but to what end? Where is the problem that needs addressing? Even if the term limits proposed took full effect today, only 1 of the 9 current Common Council members would be affected. Half the Council members have served fewer than 4 continuous years. And no less than 4 of the Council members aren’t seeking re-election this year. Council members have a history of term-limiting themselves. And if they don’t, voters can ask them to. I stated when I ran for alderman that I wouldn’t serve more than 2 or 3 terms as alderman (well below the limit now proposed) and I’m sticking to it. But that’s a pact I made with voters, and my willingness to live up to it will be transparent. If I don’t, they should vote me out. That’s the proper way to deal with elected officials who, you think, have served long enough. Jean Jacobs: The responsibility of every candidate running for an elected position is to educate their public so the voter is informed regarding issues when they go to the polls. I do not support term limits because we must encourage and promote the importance that every vote counts. With less than 50 per cent voter participation at the polls we must begin to be innovative and create that Fire in The Belly in each registered voter to take charge of their right to vote. Voting at the polls is democracy in action. Steve Ladin: I don’t think good leadership will be lost by instituting term limits. One can serve the public in a variety of elected offices, community service organizations, boards of directors, etc. One needs to look no further than the NYS Legislature. If term limits existed on the State level, perhaps it would not be such a big deal to have a budget passed in a timely fashion. The power concentrated in the hands of a few members with seniority has provided fertile grounds for corruption, conflicts of interest, and other sins against we the people. Term limits were a democratic ideal for our Founding Fathers, part of the Constitution. The President is, after all, not a monarch, and neither should the Mayor or members of the Common Council. Andi Turco-Levin: As with every issue, there are positive and negative sides. The question here is which offers a better form of government for the future? Is an elected position an entitlement you get for years of service or is it to allow new generations who wish to move government forward? From my perspective after sitting on the Common Council with both seasoned veterans and newcomers, I believe that Term Limits are necessary after a while. It is true that it takes a little while to settle in and learn the process to move legislation through. However after too long a period of time lawmakers tend to use the past for reasons to reject new proposals or initiatives that are innovative or creative. Putting a limit on how long someone can serve will still allow for experience (as much as 12 years in the legislation I proposed), yet will encourage new leaders to step up and put forth new and improved ideas. It can also be argued that long time politicians will vote on measures to insure their place in office which may not be the right thing for the people they represent. Sadly, the subject of corruption can find its way into many elected positions and having term limits can be one way to discourage this from happening as well. KC.org: The Mayor appoints the vast majority of positions at City Hall. Are you satisfied with this or do you feel that the common council should be a voice in this process? Shayne Gallo: In my administration, all branches of government will be encouraged to communicate and exchange ideas about important issues . Personnel decisions are clearly important issues and I will certainly solicit and consider the opinions of members of the common council. Jean Jacobs: My business plan as a candidate for Mayor offers a change in the organizational chart. The Mayor and the Common Council should not be in charge of appointing positions or negotiating contracts. I would create a position of a Business Manager. The current system needs to be managed and governed by someone with business and contract credentials. The Mayor is the CEO and he/she will delegate and will be responsible for the day to day operations of The City of Kingston. Steve Ladin: I believe that this should be a shared responsibility. Some positions are executive in nature and should be appointed by the Mayor. Other positions are legislative in nature, and should be appointed by the Common Council. Problems in filling vacant positions can occur if approval is needed by both the Mayor and Common Council. Witness the vast number of federal vacancies that take years to fill on account of the Congress delaying the approval process of Presidential appointees. On another level, many appointees (made by the Mayor), in my judgment, have been incompetent. Have they been appointed because of Party loyalty? ; political favoritism? ; campaign or other personal contributions/relationships? The practice of filling vacancies at City Hall, whether it’s done by the Mayor or the Common Council needs some ethical and conflict of interest oversight. Professional standards verifying the qualifications of all individuals nominated to a position at City Hall need to be applied. Andi Turco-Levin: With the Strong Mayor form of Government as outlined in the City’s Charter, the Mayor appoints most of the key positions for City Hall and since these titles answer to the Mayor, I feel that he/she is the one who is responsible for the outcome of how they do their job. The Council is there to represent the people of the City and Council’s role is to insure they have proper representation. The two are separate, yet need to work in harmony. If these department heads are not performing their duties it will be evident in the loss of services, safety, infrastructure etc., which is what the Mayor will be judged on come election time. This is why it should be the Mayor’s decision on who is part of the team that is chosen to run the City and it is the Mayor’s responsibility to see these departments are effective and productive. Of course, keeping the lines of communication open is a key component for success on all levels. The Kingston Land Trust and the Kingston Land Trust African-American History Committee hosts a re-dedication ceremony of the Mt. Zion African-American Burial Ground on Sunday, June 5th 2011 at 3:00pm. The community at large is invited to attend and to celebrate Kingston’s African-American heritage and Civil War 20th Regiment Veterans laid to rest there. Kingston – The Kingston Land Trust and Kingston Land Trust African-American History Committee have organized a historic event for Kingston, Ulster County and New York State. A re-dedication of the Mt. Zion African-African Burial Ground located on South Wall Street in Kingston is planned to take place on Sunday, June 5th 2011 at 3:00pm, rain or shine. Guest speakers will include surviving family members, Dr. AJ William Meyers, members of the AME Zion Church, the Veterans Association of Kingston and Ulster County Executive Mike Hein. A reception will follow and be held at the AME Zion Church of Kingston located at 26 Franklin Street in Kingston, NY, which is the oldest African-American church in Ulster County and intimately associated with the Mt. Zion African-American Burial Ground. The cemetery, an approximately 2.4 acre irregular shaped site is located on a hill on the southeast side of South Wall Street in Kingston. The site is the second African-American Cemetery in Kingston and represents the key component of history of the African-American community in Kingston from the mid 19th Century onwards. The cemetery contains the names of many of Kingston’s early African-American families and includes Dutch and French Huguenot surnames of Ulster County families for whom their family members had likely once served as slaves and as such forms a vital visible legacy for Kingston’s African-American community. In addition, a notable number of veterans are buried in the cemetery including numerous Civil War veterans who served in the US Colored Troops, 20th Regiment. Since the formation of the Kingston Land Trust African-American History Committee in the fall of 2010, the current local landmark has been the focus to obtain state historic preservation status so to protect and preserve an African-American cemetery that houses rich African-American history in the city of Kingston. View historic and significant African-American locations and properties. The Mt. 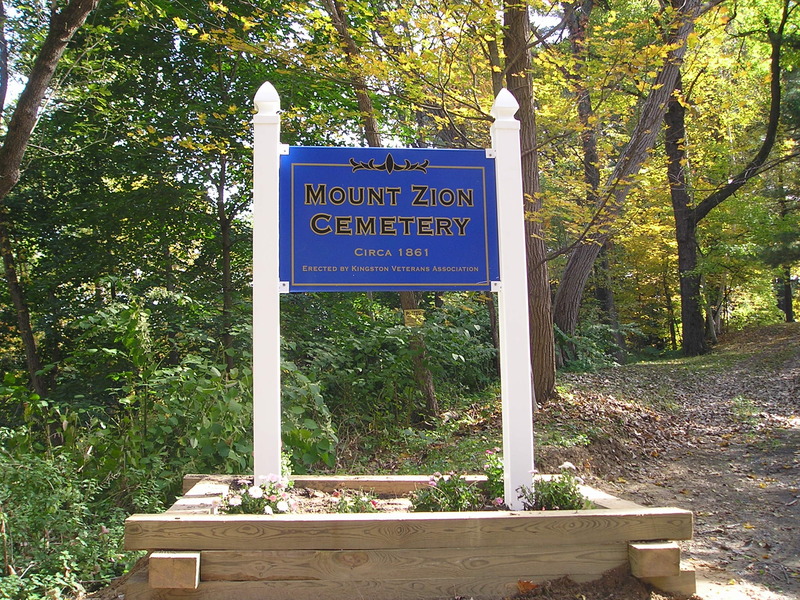 Zion African-American Burial Ground does not have an exact street address. Here, the mapping device will help you to simply locate it as you make travel plans to attend. About the AME Zion Church of Kingston The oldest African-American church in Ulster County, this dignified church is of transcendent importance to the African American community in Kingston. Erected for the AME Zion congregation and established in 1848, the building was built under the pastorate of the Rev. Ebenezer O. Clark. About the Veterans Association of Kingston The Kingston Veterans Association is comprised of local Veterans organizations from in and around the City of Kingston as a central place where veterans can organize and work together towards common goals that include the VFW, American Legion, Disabled American Veterans, Vietnam Veterans, Marine Corps League, and Navy Seabees. They conduct the annual Memorial Day Ceremony and Parade, the Veterans Day Ceremony and are responsible for the placing of flags on the cemeteries in the City. About the Kingston Land Trust’s African-American History Committee The Kingston Land Trust African-American History Committee is charged to uphold the integrity, accomplishments and contributions made by African-Americans who lived or are living in the city of Kingston, NY.